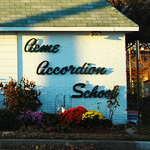 The Acme Accordion School is under the direction of Mr. Stanley Darrow, an internationally known classical accordionist. He has made a career of demonstrating the accordion’s vast potential as a serious musical instrument of concert stature. Mr. Darrow keeps abreast of the field through regular concert study tours in Europe including the famous State Accordion College in Trossingen, Germany. His lectures and recitals have taken him from Rowan University in New Jersey to the Pilzen and Prague Conservatories. He is a board member of the Accordion Teachers Guild and a founding member of the American Accordion Musicological Society. Want to add or edit a listing? Let us know.